Kill Death Watch Beetle - surface spray with Boron Ultra 12 and inject Boron Paste, or Ultra Timber Paste, depending on whether the wood is damp or not. Boron Ultra 12 is a clear, odourless, water based fluid and the injection pastes are fast acting creams supplied in cartridges. See timber injectors. 2. Drill test suspicious areas with a wood Auger to determine the extent of the attack zone. We suggest using an 8mm diameter Auger. Examine the bore dust for signs of beetle 'frass' - this is the insect's bore dust and no wood fibres will be found in these parts. 3. For valuable beams consider using our Ultra Sound and Resistograph testing service. 4. Clean off all loose wood, surface 'frass' and tunnel material to reach sound, solid timber. 5. Remove any residual surface stain, paint, wax or varnish. No surface chemical treatment will penetrate these finishes. 6. Brush and vacuum clean, to remove all the dust and debris. 7. Apply Boron Ultra Gel by brush, if the wood will not require a paint, stain or varnish finish after treatment. 8. Apply 2 coats of Boron Ultra 12 at 5% in water by brush or spray, for wood that you wish to paint, stain or varnish afterwards. 9. Apply Boron Ultra Paste by injection, to damp areas, like those embedded in the wall. 10. Apply Ultra Timber Paste, by injection, to dry areas, like those not embedded in the wall. See timber injectors. You will have to delete steps 4, 5, 7 and 8 above - go straight to step 10. Check for fresh Death Watch Beetle holes annually and re-treat if active. This insect can be a structural hazard to your building, so consult us, or a Professional Building Surveyor before carrying out treatment. Listen for the distinctive tapping sounds. A unique Boron based Borax powder concentrate, ready to dissolve in water, designed to treat timber by brush, spray or dipping. It avoids the hazard problems of many liquid insecticides by using only water as a carrier. It can also be used in most wood preservation situations to replace other less friendly contact type insecticides, including Permethrin. The Boron powder is dissolved in water to treat Death Watch Beetle at 5% (BAE) for the following coverages, based on applying two coats by brush, or low pressure sprayer: Boron Ultra 12 only kills wood boring insects and has natural Fire Retardancy properties. Boron Ultra 12 has natural Fire Retardancy properties and this is an obvious benefit when you are treating wood in buildings. The Boron compounds are frequently used in many industries to provide Fire Retardant properties, for example in board products and building materials. .
Added Fire Retardancy - to further reduce the fire risk in your building you can now buy our Fire Retardant Additive to pour into your Boron Ultra 12. It has no odour or hazards and simply boosts the natural fire retardancy without affecting the woodworm treatment. A Boron based brushing Gel ideal for damp stained wood, end grain and bearing area treatment of beams and joists. Also useful for medium to heavy active infestations of insect attack and treatment of new timbers for use in vulnerable areas (e.g. back of skirting boards). Apply to bare surface timber as part of the control of Death Watch Beetle. Essential for the control of Death Watch Beetle in damp or wet wood, especially in embedded timber beams and joists sitting in or on a wet wall, because it also kills wood rotting fungi, like Wet Rot and Dry Rot. An alternative treatment for drier timber (under 12% TMC) - Permethrin in an emulsion cream base. Has some odour and solvent. Do not use in buildings housing fish or birds. Essential for deep seated active Death Watch Beetle, or the voracious House Longhorn Beetle, where the moisture content of the wood is too low to spread the Boron based paste. 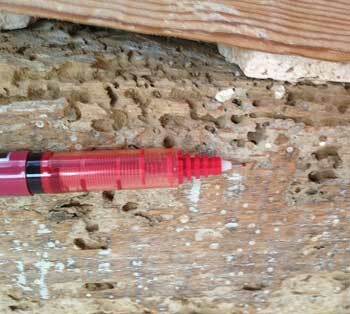 Essential for the control of Death Watch Beetle in dry wood, where Boron based Paste will not spread quickly. See timber injectors. See our Woodworm Technical Information page for Product Safety Information. The Boron based product, Boron Ultra 12, used for Woodworm Treatment when diluted in water at 5% BAE is fully Licensed by the HSE and is not required to carry any hazard warning labels.